Under this category of LED high bay coolers we classify everything what goes as a top light in an industrial environment from a few thousands of lumen all the way up to our extreme power coolers from up to 100.000 lumen. Even in indoor environments we see the need and have covered this with an extensive range of products for special coatings creating longer salt or corrosive resistance as well as waterproof degrees up to IP67. 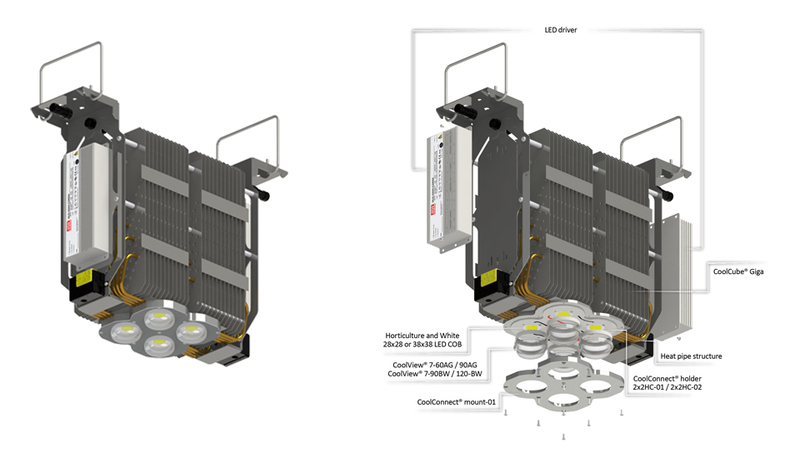 MechaTronix is the proud owner of over 10 patents in this world of LED high bay luminaires. The luminaires are tilted over a certain angle, need in that way an optimisation to convect the cooling and optimise the air flow in that condition, and on top of that are many times needing an IP67 waterproof design and/or a specific surface treatment to widthstand the climatical circumstances they are exposed to. A second family of high bay coolers are our famous CoolBay® coolers - these patented designs have the CoolTube® heat column in the center, which guarantees the fastest heat transport ever from a small LED source. In this way we can cool down powerful COBs or LOBs as high as 30.000 lumen. The heat sink around the core is designed in this way that it has the same diameter and looks as the circular LED drivers which are mounted on the top of them. The biggest advantage of these high bay designs over UFO designs is the perfect optical controls you get. With the small LES area of the COBs or LOBs the combined lenses give you a perfect light image, from an installation as high as 20 meters to a low ceiling with specific batwing lenses. Also the very low glare what you get creates extra comfort to the employees working in that environment. MechaTronix has created its own high performance series of glass lenses for the CoolBay® LED coolers, comprising of standard beam angles with anti-glare as well as more complex beam angles in batwing effect to create a uniform light pattern starting from lower heights. This series of lenses has been dubbed the CoolView® 10 series, more details as below. 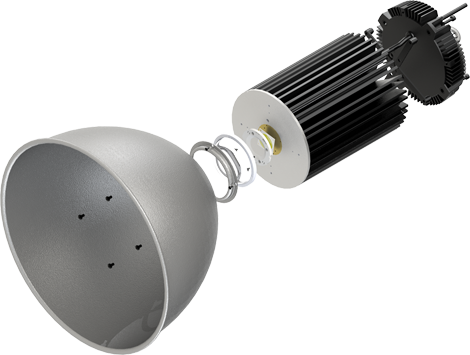 This ultimate high bay LED cooler (of course patented) can handle up to 100.000 lumen from 4 COB or LOB light sources.The heart of the CoolFin® is built around 16 sintered heat pipes conducting the heat away from the LED sources and transferring these to a sophisticated stack fin structure. With and overall width and length of just 468 x 446 mm, and a height of 226 mm, the CoolFin® is by far the most extreme dense high bay LED cooler on the market. The CoolFin® is not just unique in cooling performance and light creation, it is a state-of-the-art creation in versatility. Over 30 different drivers ranging from 150W all the way up to 600W can be mounted on the modular PSU brackets. Even the mounting towards the environment has been made versatile: eye ring for hanging applications, normal screw holes for direct ceiling fixation or click-and-go clips to go over a building profile. To make the implementation as easy as possible, MechaTronix has developed a range of accessories around this platform allowing easy integration without heavy tooling costs. An overview of the accessories here below. A bit comparable to the CoolFin®, the CoolCube® also start from the same platform of 4 times a COB or LOB LED engine as light source. Again 16 sintered heat pipes transfer the heat to a complex stack fin structure. The only big differentiator towards the CoolFin® is the overall looks - the CoolCube® is made as a cubical design with a minimal width, resulting in overall sized length 575mm, width 200mm and height 417mm. The CoolCube® shares the same versatility idea as its flat brother. Over 30 different drivers ranging from 150W all the way up to 600W can be mounted on the modular PSU brackets. Even the mounting towards the environment has been made versatile: eye ring for hanging applications, normal screw holes for direct ceiling fixation or click-and-go clips to go over a building profile. All accessories as above are in common on this platform.